Another post based on travel plans – this weekend a group of Marist Italy BA students are embarking on a long weekend in Puglia, and thus, we need to know what to eat! 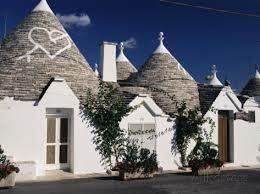 The heel of the boot, Puglia is emerging as a force of nature in the Italian culinary and tourism scenes. With beautiful coastline and delicious food, we can see the appeal! Read on to find out the best of what Puglia has to offer. Semolina flour is transformed into a variety of handmade pastas (some shaped like little ears, others like concave shells, others still like thick ropes) which are boiled with wild or cultivated greens, tossed with hearty meat ragùs, or cooked into soups. 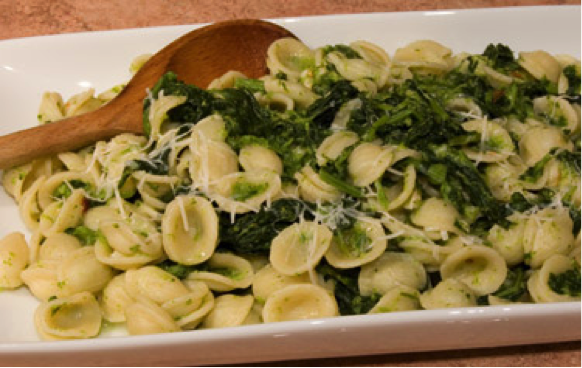 Orecchiette con Cime di Rapa– Orecchiette with Broccoli Rabbe. Orecchiette are an ear-shaped pasta prevalent in southern Italy paired with greens or vegetables such as broccoli, broccoli rabbe, and cauliflower; feast-day orecchiette call for robust meat sauces instead. Cavatieddi con la ruca- is topped with a sauce of cooked arugula, tomatoes and pecorino cheese. Almost every dish (from sublime tomato-topped bruschetta to lamb baked with bitter onions and potatoes) is doused with olive oil: after all, Puglia is Italy’s largest producer of olive oil. Fava beans, a Puglian’s favorite legume, are transformed into thick soups, refreshing salads, and comforting side dishes, and rice is baked with potatoes and seafood or vegetables to make an unusual main course called tiella (named after the pot in which it is cooked). Puree di Fave e Cicoria– Fava Bean Puree with Wilted Wild Greens. This is the classic fava bean puree of Puglia, served alongside garlicky, olive oil-smothered greens. Oysters and mussels are the preferred shellfish, but octopus, squid, sea urchins and fish dishes are enjoyed as well. Ostriche alla tarantin– oysters from the Gulf of Taranto, baked with olive oil and fresh parsley after breading, savored raw with a squeeze of lemon to underscore their briny flavor. Orata alla barese- roasted fish with grated pecorino, garlic and potatoes. Even cuttlefish are baked after being stuffed with chopped squid and mussels and seasoned with grated pecorino, bread crumbs and capers. Zuppa alla tarantina- is a peppery soup combining fish and shellfish and cooking them with tomatoes and spices, generally served with hot toasty garlic bread. Occasionally referred to as the “caviar of cheese” this delicious dish is a pouch of fresh mozzarella filled with the scraps of mozzarella and extra cream, giving it a smooth outer shell and oozing center. Traditionally wrapped with leek leaves to keep it together and indicate freshness (as the leaves only stay green as long as the burrata is fresh, only two to three days), burrata is either served alone or with prosciutto, bread, or fresh tomato with olive oil. When it comes to sweets, the Apulian appetite for honey, nuts, and dried fruit. Bocconotti– half moon shaped cookies with marsala in the dough and jam and cream put into them before baking. Pantaloni- (The pants) are dough filled with mustard or grape or from a puree of sweetened ceci (chickpeas – this seems to be an homage to the ancient Saracen roots of this region) and finally moistened with cooked wine or honey. Scarcella or Squarcella- have a sweet flour base, sugar, eggs and oil, and have the form of a dove, a basket, or a heart. In the center a whole hard-boiled egg is imprisoned with crosses of dough. Corrucolo- The Puglian Corrucolo can have different names such as “scarciedda” or “palomba” in the Bari area. 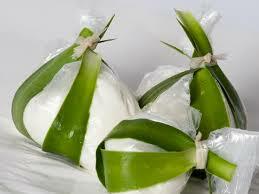 The main ingredients for preparing this sweet are: sugar, olive oil, milk, eggs and flour. 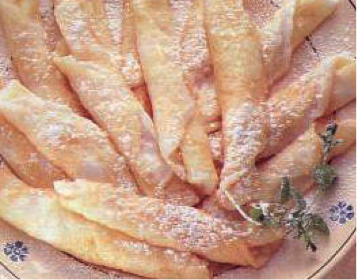 Dita di Apostoli- small crepes rolled up and filling with ricotta cheese, chocolate and liquor. They use alcohol, particularly red wine, for the traditional recipes. It’s a combination of the local wine and pastry traditions. Next Next post: Why Are Dogs Allowed Everywhere in Florence?